MAJURO, Marshall Islands, May 28, 2018 (BSS/AFP) - Haze from the Kilauea volcano eruption in Hawaii blanketed the Marshall Islands 3,700 kilometres (2,300 miles) away on Sunday, as officials warned it would continue moving west. The haze, a phenomenon known as "vog" or volcanic smog, "is spreading across Micronesia," the US National Weather Service based in Guam said. 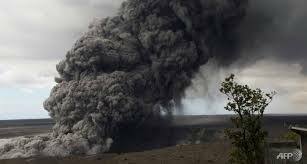 The volcano on Hawaii's Big Island is now in its fourth week of eruptions. Meteorologists advised residents on the Marshall Islands with respiratory problems to stay indoors while airlines and shipping companies were warned to be aware of "lower visibilities".